DreamzIoTIoT TechnologyHow IoT is changing Public Sector services ? The digital space is constantly evolving. Transformations happen every year. Some create history, other get lost in history but each one plays an important role in building the shape of our present and future. One such transformation which promises to change our lives for the better is IoT. It is true that IoT is changing the operations in many industries and it is also able to improve the public sector services by adopting various devices. Already public services have been taking this into account and started the practice. This is now leading us towards the era of “Smart City” where the citizens are now more connected. In simple words, the Internet of things refers to the number of devices connected to the Internet with the prime objective of collecting and sharing data. These objects could vary from anything to a comb or a microwave to a toy or a self-driving truck. These devices are generally independent of any human action are primarily used to improve the environment they are used in. For example, if your job needs you to be in another city and your parents need your constant care and observation, an IoT enabled smart house makes your life easier. With sensors fitted in everywhere, it will not only keep their medical stats in check but also send an SOS to their doctor and you in case of an emergency. This technology not only makes our lives easier but also limits the chances of mishaps. IoT is the future and by now we have learned the innumerable benefits of IoT in the private sector. But IoT being its versatile self not only benefits the private sector but also the public sector. Apart from the fact that every connected device can be controlled remotely, the ability of IoT to extract and analyze the data makes it a very useful tool for any government. 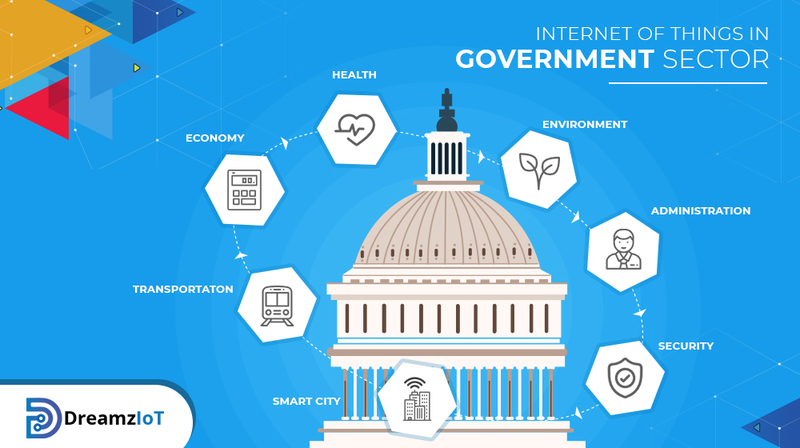 Let us look at a few areas where IoT can prove to be of massive advantage to the government. The national security and defense of a country is always a priority and the tools required to maintain them should be top-notch. IoT will not only be cheaper and better but also convenient and safer. The automation of process through IoT will remove chances of mistakes which otherwise can cause massive troubles. The accuracy and speed that IoT guarantees is something that cannot be promised by any other technological tool. The need to have a sustainable environment has given rise to the need of smart cities. The automation of the process not only helps the residents live a smart and easy life but also makes the authorities more efficient. IoT links different systems together to collect and analyze data which in turn is used to transform the entire system. IoT will not only make individual life more efficient but will aid in making the interaction between citizens and cities real-time and advanced. A country cannot be called a developed one until and unless its citizens are employed and are living a life where they can provide themselves with basic amenities. Through economic evaluation, IoT can help the government create more jobs and also upscale the existing ones. The collected data can help in analyzing the various industries for possibilities and expansion. Better monetary tracking and modeling can also be achieved through this wonderful technological tool. City planning involves a lot of complex factors and processes. IoT will not simplify these factors and processes but will also help in eliminating the unnecessary ones to make the entire planning more efficient. The analytics provided by IoT during zoning, mapping, etc will be more accurate and helpful as compared to the traditional methods. IoT leaves no scope for mistakes or poor studies which will save a lot of time and capital and the functional information provided can be used to optimize the further. The processes become quicker and cost-efficient. IoT can help warn about both natural and manmade emergencies. The data collected can be utilized to minimize casualties. IoT can be used to enable responders to become more aware of and resolve the emergencies more efficiently.